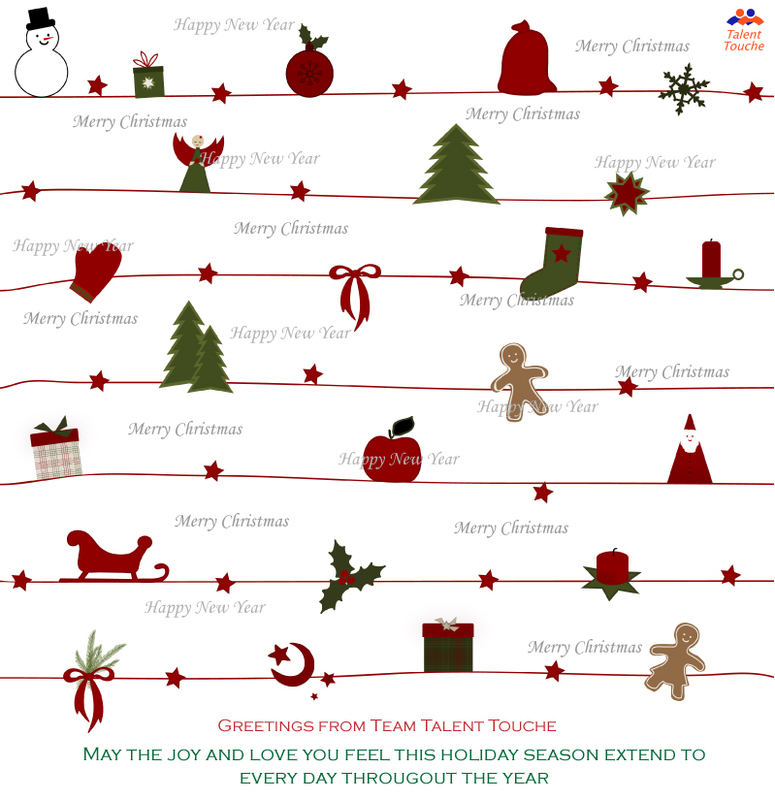 Merry Christmas and Happy New Year from Team Talent Touche! Be on time every day.It’s your business. Lead by example. Don’t make a habit of leaving early.Your employees will resent you if you walk out the door at three and call them from the gym at five-thirty to check in. Don’t go drinking with your assistant.Or swap stories. Again, you’re the adult now. You need to set the example. What you do in your private time away from the office should remain fodder for your peers, not your subordinates. Even when you’re dying to tell someone about last night’s disastrous date, resist the urge. Don’t ask them to do anything that is not work-related.It’s rude and fosters resentment. This includes walking your dog, picking up your dry cleaning, and buying your personal holiday presents, unless, of course, the job is personal assistant. Don’t let them hear you on personal calls.Again, you are the adult. Not only will they will imitate you for months if they hear you refer to your husband as “Dr. Love,” they will feel entitled to be on their own calls all day. You are not their friend.Be a pleasant boss, but never leave the door open to talk about the dating drama. You will want your employee to feel comfortable talking to you about serious personal problems (especially if they will impact her job performance) – a sick mother or child-care problem, for example. But the last thing you can afford is to become a surrogate therapist for employee dating or marital woes. Pitch in when you can.If you have assigned what you know to be a tedious task, such as mailing five hundred company brochures, spend at least a few minutes pitching in. This is your team; make it happen together. A little willingness to get your hands dirty will go a long way when you need a really big ditch dug. Do not share company financial issues or problems.If your employees suspect things are not going well, they will be looking for another job before you know it. There is a whole philosophy of open-book management that works in big public companies (the law requires it, anyway), but in small companies you don’t need your employees second-guessing your decisions. If something goes wrong with a client or customer, you have to take the blame.As the boss, you are responsible for everything running smoothly. If you have a problem employee, you need to monitor her closely, provide more training, or let her go. You cannot make bad employees the scapegoats for mistakes. Manage, but don’t smother.Granted this is your business and you’ve got the most to lose, but you’ve got to let your employees take responsibility for their workload. Guide, cajole, pester — don’t suffocate. These are five of the top issues that destroy trust between employees and in organizations. If you can avoid these five trust busters, you will have gone a long way toward ensuring that trust is building in your organization. Lies, lies of omission, failure to walk the talk, failure to do what you say you will do, and subjecting employees to random, haphazard, unexpected change destroy trust. Walk on the better path. Build, don’t destroy trust in your organization. You can make their day or break their day. Your choice. No kidding. Other than the decisions individuals make on their own about liking their work, you are the most powerful factor in employee motivation and morale. As a manager or supervisor, your impact on employee motivation is immeasurable. By your words, your body language, and the expression on your face, as a manager, supervisor, or leader, you telegraph your opinion of their value to the people you employ. Building high employee motivation and morale is both challenging and yet supremely simple. Building high employee motivation and morale requires that you pay attention every day to profoundly meaningful aspects of your impact on life at work. Picture Mr. Stressed-Out and Grumpy. He arrives at work with a frown on his face. His body language telegraphs “over-worked” and unhappy. He moves slowly and treats the first person who approaches him abruptly. It takes only a few minutes for the entire workplace to get the word. Stay away from Mr. Stressed-Out and Grumpy if you know what’s good for you this morning. Responding to my question, she said that part of her success was that she liked and appreciated people. She sent the right message. She also uses simple, powerful, motivational words to demonstrate she values people. She says “please” and “thank you” and “you’re doing a good job.” How often do you take the time to use these simple, powerful words, and others like them, in your interaction with staff? You can make their day. In the best book I’ve read on the subject, Why Employees Don’t Do What They’re Supposed to Do and What to Do about ItCompare Prices, by Ferdinand Fournies, setting clear expectations is often a supervisor’s first failure. Supervisors think they have clearly stated work objectives, numbers needed, report deadlines and requirements, but the employee received a different message. The ten tips, outlined in this article, are the keys to supervisory success in creating positive employee motivation and morale. The challenge is to incorporate them into your skill set and do them consistently – every day. Author, Jim Collins identified disciplined people doing disciplined things every day as one of the hallmarks of companies that went from Good to Great: Why Some Companies Make the Leap… And Others Don’tCompare Prices. You can make their day. build empowered teams and individuals in a teamwork environment. If you are unhappy with the caliber of the people you are hiring, whose responsibility is that? If you are unhappy about the training people in your work group are receiving, whose responsibility is that? If you are tired of sales and accounting changing your goals, schedule, and direction, whose responsibility is that? Sometimes, it’s the little things that can send your resume into the reject pile, without it even getting a close look. Naming your resume “resume” can send it to the trash faster than you can blink. So can forgetting to write in proper sentences. At ERP Software Advice, the company sorts through about 150 candidates for each hire they make. Only about twelve of those 150 candidates get to a first-round phone interview. Many of them are rejected for little, and sometimes silly, things like how you name or save your resume, that are still enough to knock the resume out of contention. Don Fornes, CEO of ERP Software Advice shares his tips on how to name your resume, how to write your letters and resume, and how to save your resume. Don’t name your resume, “resume.” About a third of applicants name their resume document, “resume.doc.” “Resume” may make sense on your computer, where you know it’s your resume. However, on my computer, it’s one of many, many resumes with the same name. By using such a generic file name, the applicant misses a great opportunity to brand themselves (e.g. “John Doe – Quota Crusher”). If you’re qualified enough to sell or market for us, you won’t miss the opportunity to at least use your name in the file name. Proofread your resume. It’s unbelievable the number of spelling, grammar and punctuation mistakes I see in resumes. Again, this is a blaring clue telling the hiring manager that you don’t check your work and you don’t pay attention to detail. PDF your resume. Not everyone uses the same operating system and word processor that you do. I use a Mac. I don’t have Word – don’t want it. My ATS can’t handle .docx files. A lot of the resumes I see come through horribly garbled. So much for that nice formatting you did (Did you?). PDF, or portable document format, is a simple solution. Afraid of failing? You’re not alone. Here are four ways to look beyond rejection and conquer your fears for good. Rejection is just an event that’s quickly over. But the fear of rejection… ah!… that can last a lifetime. Suppose you make a cold call and the prospect hangs up on you. While that’s feel like “rejection”, the truth is that the prospect’s reaction has nothing to do with you. You had no way of knowing that the prospect was busy and that the prospect thinks it’s OK to hang up on unfamiliar callers. Maybe if you said something different or called at a different time, you might have gotten a different reaction, but that’s just a story you’re making up in your own mind. If you had called at a different time, the prospect might just as easily have added a expletive before hanging up. Most “rejections” don’t have anything to do you with personally. Anybody else taking the same action that you did, at the same time, would have gotten the exact same reaction. The “rejection” is simply a hallucination that your emotions have created to “explain” the event. When it happens too frequently. It’s one thing to shrug off a bad cold call because, after all, that’s only one person’s opinion. But after twenty, thirty, forty “rejections”, each call starts adding weight on your shoulders. When you care about the rejecter. If you’ve got a relationship with somebody, it hurts more if they reject you than if a stranger does the same. As your level of emotional involvement increases, the pain of being rejected increases. When you consider the rejecter to be important. If you feel that somebody is “better” than you or of superior intelligence, talent, etc., you tend value their opinion. So if that person rejects you, you’ll take it more to heart. Your job is to identify the specific circumstances that are causing the “sting”… then we can begin work on neutralizing it. How famous or “important” must a person be before I begin to feel that a rejection from that person would be impossible to shrug off? It’s really that simple. Reframing the “source” of the fear expunges the fear, thereby extracting its sting. Here’s what Art Mortell once told me about dealing positively with rejection. This is true for small firms as well as large ones. It’s not just succession to the top – It’s getting the right person in place for every job. Some of tomorrow’s key jobs may not even exist now. If a firm plans to double in size in five years, they will need more talented managers. The larger issue is leadership development, tracking, and developmental opportunities. The real key in succession management is to create a match between the organization’s future needs and the aspirations of individuals. The only way to keep talented people is to provide them with growth opportunities that keep them stretching and finding more promising opportunities they might find elsewhere. The average college graduate will change jobs five times in his or her career. Within the next decade, this norm will probably increase to seven job changes. Recruiting and retaining leaders becomes an economic and strategic challenge. Succession management serves as an interface between the human resource function and the strategic direction of an organization. In this role, it is a vital resource in anticipating the future needs of the organization and helps find, assess, develop, and monitor the human capital required by the organization’s strategy. While serving as trusted adviser and confidant of the CEO, the succession management function may also reflect the concerns and needs of line executives throughout the business units. To discover what leading practitioners of this complex art have learned, 16 firms sponsored an investigation with the American Productivity and Quality Center into the succession management practices of companies who had been identified by published reports or nominated by the study team as potential “best practice partners.” The study sponsors voted to choose Dell Computer, Dow Chemical Company, Eli Lilly and Company, PanCanadian Petroleum, and Sonoco Global Products as firms they would like to visit and study their approaches to management succession. In this investigation, we found that succession management is a continuous annual process. It requires an ongoing commitment of top executives, divisional HR Staff, and succession management specialists. At Dell Computer, committed top executives were able to assemble a succession management program very rapidly, and they have used it to manage an incredible rate of growth without major discontinuities. Collaboration between the CEO and succession management teams can create a virtual cycle of success. All best-practice partners felt fortunate to have the enthusiastic support of the top management. But this support was not gratuitous and was earned by providing an essential service. At Dow, the process was designed with the active involvement of the CEO, the vice president of human resources, and the workforce planning strategic center. At PanCanadian, the CEO is the key sponsor for succession management, and a senior management committee of vice presidents steward the process at the corporate level. One of the clearest insights discovered is that effective succession management is a journey, not a destination. The best-practice partners in this study did not succeed in their first efforts at succession management. Similarly, none have rested on their laurels since having their process up and running. They continually see and adjust their systems as they receive feedback from line executives, monitor developments in technology, and learn from other leading organizations. For example, Dell reduced the degree of computerization for succession management data in response to feedback from the field. Conversely, Lilly focused on providing a single integrated, centralized, and synchronized database of succession information. Succession management identifies and monitors various talent pools within the organization to match the future needs of the organization with the bench strength of available talent. Not having the right talent in place is often a growth-limiting factor in achieving business potential. With the impending retirement of baby boomers and increased demands for diversity, leading organizations are building systems that provide talented, high performers opportunities to grow. For example, Sonoco identifies eight separate pools that are sorted by division or business unit. PanCanadian focuses on “bright lights” and critical skills but also looks across the organization, especially for high potential young managers reporting to senior executives. Talent assessment is a semi-transparent process in best-practice organizations. Most managers receive feedback and information about their developmental needs and suggested activities for further growth. Individuals who have been designated as high potential are seldom told of this designation to avoid raising expectations. At Lilly, an eight-page talent identification questionnaire is used to evaluate the assumed potential of 15,000 associates on performance, potential derailment factors, and learning agility. Similarly, Dell uses scaling calls to determine an individual’s level of talent. The use of technology in succession management varies widely within the best-practice organizations. Yet, web-based systems seem to offer great potential for worldwide access and large-scale integration of data. As suggested previously, Dell has moved from more extensive global software applications to a much simpler MS Excel workbook to organize data. Sonoco moved to integrate four commercial applications (PeopleSoft, HRCharter, Lotus Notes, and ExecuTRACK) into a seamless system that can be globally accessed and updated daily. Meet Organizational Needs Best-practice partners employ a wide range of developmental activities to engage leaders and extend their capabilities. These firms spend considerable time creating stretch developmental opportunities that are consistent with the organization’s needs, as well as with those of the individual. Several firms reported that they would give people a temporary assignment as a part of, or tied in with, an action learning assignment. Dow Chemical offers mentoring, coaching, and action Iearning along with university-based programs. Dow’s internal research indicates that graduates of their internal executive education program showed improvements in strategic thinking, external focus customer orientation, and global view. Dow also offers an extensive array of training courses on-line. They report 14,000 on line courses were completed online in one week. Eli Lilly uses individualized developmental plans, 360-degree feedback, job rotation and a formal mentoring program as part of their developmental arsenal. All best-practice partners use some variety of a nine-box matrix for classifying the performance of their managers. In most instances, this matrix (originally popularized by General Electric) assesses individuals on the basis of performance, corporate values, and perceived potential. An individual who is performing well may not be judged as highly as someone who has not gotten comparable results but has persevered in a real stretch assignment. A popular competency was “learning agility.” This refers to the ability and willingness to learn new material and adapt to new situations. The major metric by which succession systems are evaluated is the percentage of openings filled from within the firm. Sonoco finds that the performance/promotability matrix is 80 percent to 90 percent accurate in identifying candidates for key positions. At Dow, the hit rate of the succession plan is the key measure. If the person elected for an open position was on the list of potential successors, the system is believed to be working. The current hit rate of 75 to 80 percent shows considerable improvement from the past and is viewed as a reasonable target. Other key metrics include diversity and cross-functional assignments. Lilly has a measurement system that ensures its senior management cadre includes diversity in gender, ethnicity, and geographic origin. Finally, a unified approach to succession management can help to maintain consistency between different business units and geographic areas, and can contribute to objectivity in an organization’s strategic human resources. For many firms, the first step in realizing these benefits will be to place succession management on the strategic radar. Then, an organization is prepared to benefit from the following best-practice principles. Best-practice organizations make succession planning an integral corporate process by exhibiting a link between succession planning and overall business strategy. This link gives succession planning the opportunity to affect the corporation’s long-term goals and objectives. Human resources is typically responsible for the tools and processes associated with successful succession planning. Business or line units are generally responsible for the “deliverables” -i.e., they use the system to manage their own staffing needs. Together, these two groups produce a comprehensive process. Technology plays an essential role in the succession planning process. Ideally, technology serves to facilitate the process (make it shorter, simpler, or more flexible) rather than becoming the focus of the process or inhibiting it in any way. Best-practice organizations use a cyclical, continuous identification process to focus on future leaders. Best-practice organizations use a core set of leadership and succession management competencies. Best-practice organizations emphasize the importance of specific, individualized development plans for each employee. Individual development plans identify which developmental activities are needed, and the “best practice” firms typically have a mechanism in place to make it simple for the employee to conduct the developmental activities. Typically, divisional human resource leaders will monitor employee follow-up in developmental activities. Best-practice partners rely on the fundamental developmental activities of coaching, training, and development most frequently and utilize all developmental activities to a much greater extent than the sponsor organizations. In addition to traditional executive education programs, best-practice partners increasingly use special assignments, action learning, and web-based development activities. Best-practice organizations develop methods of assessment to monitor the succession planning process. These methods vary according to business goals and company culture. When the firms who had been recognized as “best-practice organizations” were asked for any insights that might be helpful to other firms interested in improving their succession management, they responded with the following recommendations. Keep the process simple. Most refinements to succession management systems involved making the process more logical and simple so that busy line executives would not feel that bureaucracy was burdensome. Engage technology to support the process. Information technology makes it possible for managers throughout the world to monitor and update developmental needs and activities on a timely basis. Making information timely and reducing the time required to manage the system are major contributions of technology. Align succession management within overall business strategy. Line executives are much more likely to support a system that clearly reinforces corporate goals and objectives. Secure senior level support for the process. None of the best practice firms would have been as successful without top management endorsement and support. The last two recommendations suggest that there is a “virtuous cycle” when the succession system supports corporate strategy in a tangible way. Obviously, senior executives are much more supportive when the system gives the achievement of their strategies a higher probability of success. My bias, from working with people for 35+ years, is to involve people as much as possible in all aspects of work decisions and planning. This involvement increases ownership and commitment, retains your best employees, and fosters an environment in which people choose to be motivated and contributing. It is also important for team building. How to involve employees in decisionmaking and continuous improvement activities is the strategic aspect of involvement and can include such methods as suggestion systems, manufacturing cells, work teams, continuous improvement meetings, Kaizen (continuous improvement) events, corrective action processes and periodic discussions with the supervisor. For people and organizations that desire a model to apply, the best I have discovered was developed from work by Tannenbaum and Schmidt (1958) and Sadler (1970). They provide a continuum for leadership and involvement that includes an increasing role for employees and a decreasing role for supervisors in the decision process. The continuum includes this progression.